From beyond the mundane symbolscape, the second album of Aeoga ‘Zenith Beyond the Helix-Locus’ emits aural phenomena from devouring multi-layered elemental ambience to amorphous and hallucinatory sequences entrancing one’s awareness thoroughly. The fifteen formations manifest themselves in various forms; bright and luminous helixes intertwine with shadowed and shapeless non-beings. All in all, truly overwhelming material where acoustic instruments and electronic equipment mingle themselves to channel forth the aural elemental current. Total running time: 67:11. The album comes in an oversized four panel cardboard covers. Limited edition of 1000 copies. 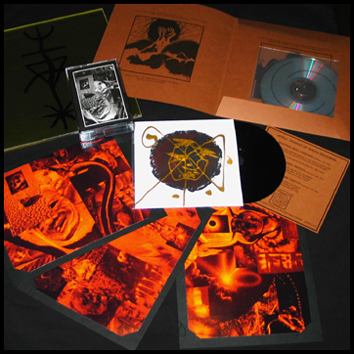 The ‘Zenith Beyond The Helix-Locus’ box set includes: ‘Zenith Beyond The Helix-Locus’ CD, ‘Triangle Of Nebula-Devourers’ CDR, ‘Palace For Vultunales’ C-20, three collage artwork insert cards, A yellow perspex plate with hand-painted drawings. All wrapped in black cloth and bound with a cord. The box is numbered and limited to 42 copies.